1.Preheat the oven to 200ºC, gas mark 6. Spread the frozen butternut squash in a single layer on an oiled baking sheet and sprinkle with the chopped rosemary. Bake for 30 – 35 minutes turning once until lightly browned. Cook the lentils in a pan of boiling water for 15 – 18 minutes until tender. Drain. 2. Meanwhile heat the oil in a large non-stick frying pan and add the onion. Cook for 5 – 6 minutes until soft and golden. Stir in the mustard, cream and seasoning and bring to simmering point. 3. 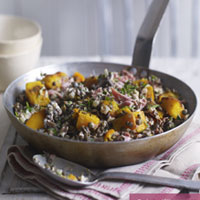 Cut the squash into even sized cubes and stir into the cream sauce with the drained lentils, ham hock, sunflower seeds and parsley. Heat through gently then check seasoning and serve. Cook’s tip: You can stir in 100g cooked frozen peas for added colour.